The “swoppster” is designed specially for children from 4 to 12 years old or who weigh from 15kg to a maximum of 50kg. 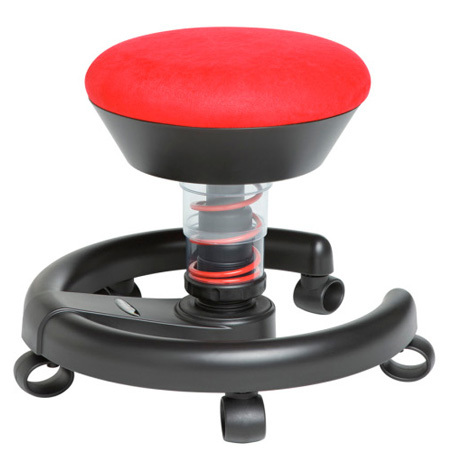 It can be adjusted individually in height, spring hardness and sideways movement. The “swoppster” strengthens your child's back. The 3D active seat for children supports and encourages constant change of posture through its flexibility in sideways movements and vertical bounce. By keeping its balance on the sprung seat of the “swoppster”, your child always has its entire body slightly in motion. The balance of the neck, shoulder and trunk muscles is maintained dynamically even when sitting. This physiological sitting keeps practically all the muscles active, well supplied with blood and generally well trained. The muscles are strengthened in this way and can better keep your child's back upright. This results in good posture and prevents backache. Swopping makes you clever. Movement underlies brain maturation. It encourages neuronal networking and thus boosts the potential for the child's mental development. The need to move is deeply rooted in each human being - children in particular. Only in a state of total unconsciousness does the human being keep still. It has been scientifically proven that movement and the closely linked sensory system of the body (proprioception) generally improves the metabolism and gives the brain a higher level of adaptation and processing. In particular, it has been shown that when the sense of balance is addressed, the supply of blood to the brain is improved and the metabolism enhanced. This in turn means more alertness, more attentiveness and better concentration. (Dr. Dieter Breithecker, Head of the German Federal Working Group for the Promotion of Posture and Movement (BAG), Wiesbaden). No backbreaking sitting on the “swoppster”. The flexible sideways movements of the “swoppster” permit the active seat to adapt itself to the child's movements and not vice versa. The joint under the spring strut permits the “swoppster” to tilt towards the working surface - your child's back stays straight. The spine moves freely over the pelvis that is inclined slightly forward - as when walking. The spine retains its natural S shape, your child sits upright more often, which is good for posture and respiration. Since the human beings are made for movement, it is unnatural for them stay in one and the same (sitting) position for long periods of time. However, if you are forced to, by rigid seats, for example, it does not take long before the very mobile segments of your body start to slump. The shoulders drop forward, the chest droops. This hunched sitting posture restricts internal organs, in particular those of the respiratory and digestive systems. Children often try to compensate this with body activity. 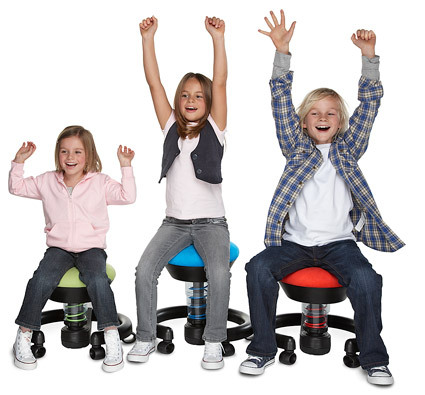 They fidget around on their chairs or start to wobble and tilt on them. Sitting in motion on the “swoppster” permits your child to move its body naturally and intuitively around its own body perpendicular as a quasi-reflexive sensorimotor reaction to the sprung seat. This is just what children who love to move around need and it also prevents dangerous wobbling and tilting. Swopping keeps you healthy and happy. The “swoppster” enables more movement than any other seat. The active, lively sitting on the “swoppster”, makes your child move more, automatically sit upright more often and thus give the diaphragm more room, breathe deeper and supply the blood with more oxygen and also makes it more alert, attentive and concentrated. You child's performance improves. Furthermore, the vertical bouncing is good for the mind - your child is happier and is more likely to be in a naturally good mood on the “swoppster”.